The Owl P9DS Dual Gel System casts and runs 1 or 2 gels in the same device. 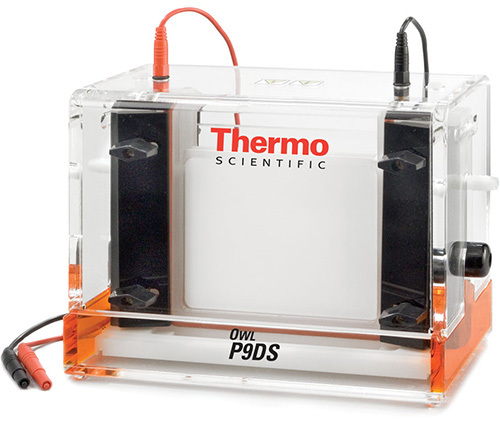 When used with the available combs, spacers, alumina plates and glass, this system is the perfect tool for SDS electrophoresis, 2-D electrophoresis, and the 16 cm width makes this an easy system to integrate in your second dimension of 2-D electrophoresis procedure. Ships complete with Upper Buffer Chamber with Internal Cooling Core, Lower Buffer Chamber, SuperSafe Lid with Attached Power Supply Leads, 4 Blank Glass Plates, 4 Notched Glass Plates, 4 Combs: (2) 10 Well and (2) 15 Well (1.5 mm Thick), Spacer Set (1.5 mm Thick), Blocking Plate for Single Gel Operation, Spacer Placer. The design allows for a very simple clamping mechanism that makes loading glass cassettes and most manufacturer's pre cast gels trouble free. You may also use the JGC-2 Gel Casting System or P1-CST Gradient Gel Caster to create gels for this system. Part Number P1-CST. The Owl P1-CST Multiple Gradient Gel Caster is 1 of the more simple devices to cast gradient gels. With an external gradient maker, gels can be cast with ease and great reproducibility. Part Number P9DS-001. Cover is not included. Part Number P9DS-012. This cover assembly includes the attached power supply leads.